As the first new luxury hotel to be built at this renowned ski resort in a quarter of a century, The Arrabelle has breathed new life into the mountain community of Vail. There's a new kid in town, and it's brought an exhilarating sense of savoir faire to the village of Lionshead—recently renamed Vail Square—in that famous Rocky Mountain skiing community. With its emphasis on exemplary service, this newcomer is pure luxury, and then some. Here, just steps away from the base of the Eagle Bahn Gondola, skiers are truly pampered; a ski valet whisks your equipment away for storage, boot warming, and overnight waxing as soon as you come in off the slopes, while the two-story stone fireplace in the lobby awaits your arrival with cheerful warmth. Each floor at The Arrabelle has a personal concierge charged with seeing to your every wish, whether it's unpacking your clothing or securing reservations at famous Vail eateries. And to get to said restaurants? There's a complimentary car service around town for hotel guests. Designed to echo the baroque style of such Alps towns as Salzburg or Innsbruck, the hotel makes an impressive new centerpiece for the European-style Vail Square, with its distinctive clock tower. Inside, common areas are decorated in a clean Biedermeier style, punctuated by locally crafted sculptures and artwork. Expansive guest rooms are warmed by fireplaces and heated floors, and sport the latest in media appointments. Large bathrooms feature cast-iron deep-soaking tubs, heated marble flooring, and flat-screen TVs. 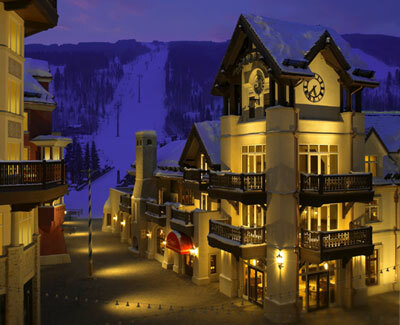 Aprés ski activities include savoring mountain views from your large balcony, swimming in the rooftop pool, or strolling through Vail Square, bustling with outdoor entertainment, boutiques, galleries, cafés, and an ice-skating rink. Oh, and don't forget to book the hotel's Ski Nanny for those days when you just want to get off by yourselves.